Join the discussion on our forums! 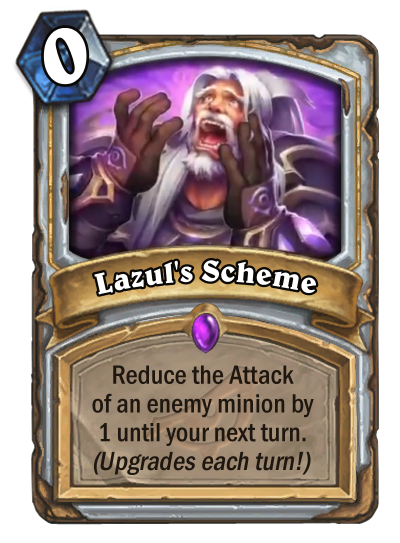 Come discuss Lazul's Scheme over in our dedicated Lazul's Scheme discussion topic. "What's that you're dreaming? You're weak and you're screaming! It must be my scheming..."
seems awesome in nomi priest. I'm gonna try the deck out today. I'd have not looked at the card otherwise though. Cabal Shadow Priest has a drawback: nothing to steal on turn 6. This card can make Cabal Shadow Priest viable. You don’t need to hold the scheme for too long; most of the time, a few turns is enough. late game combo wombo shenanigans mainly. With Forbidden Words and Shadow Madness and Cabal Shadow Priest and some such. But it being Scheme makes it a bad topdeck. so you want it in your hand ideally then? you mean that drawing it is bad as it's a dead card 99% of the time for a few turns? yeah I get that. they are very risk reward. I think this expac has been a solid one for sure.